This volume of Modern Aspects covers a wide spread of topics presented in an authoritative, informative and instructive manner by some internationally renowned specialists. Professors Politzer and Dr. Murray provide a comprehensive description of the various theoretical treatments of solute-solvent interactions, including ion-solvent interactions. Both continuum and discrete molecular models for the solvent molecules are discussed, including Monte Carlo and molecular dynamics simulations. The advantages and drawbacks of the resulting models and computational approaches are discussed and the impressive progress made in predicting the properties of molecular and ionic solutions is surveyed. The fundamental and applied electrochemistry of the silicon/electrolyte interface is presented in an authoritative review by Dr. Gregory Zhang, with emphasis in the preparation of porous silicon, a material of significant technological interest, via anodic dissolution of monocrystalline Si. 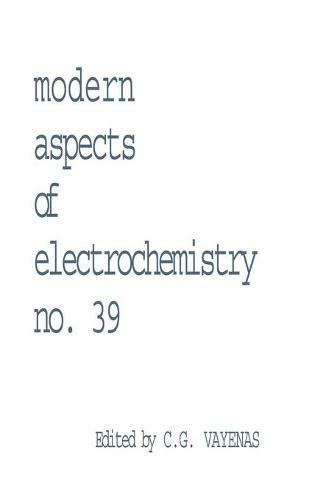 The chapter shows eloquently how fundamental electrokinetic principles can be utilized to obtain the desired product morphology. Markov chains theory provides a powerful tool for modeling several important processes in electrochemistry and electrochemical engineering, including electrode kinetics, anodic deposit formation and deposit dissolution processes, electrolyzer and electrochemical reactors performance and even reliability of warning devices and repair of failed cells. The way this can be done using the elegant Markov chains theory is described in lucid manner by Professor Thomas Fahidy in a concise chapter which gives to the reader only the absolutely necessary mathematics and is rich in practical examples.